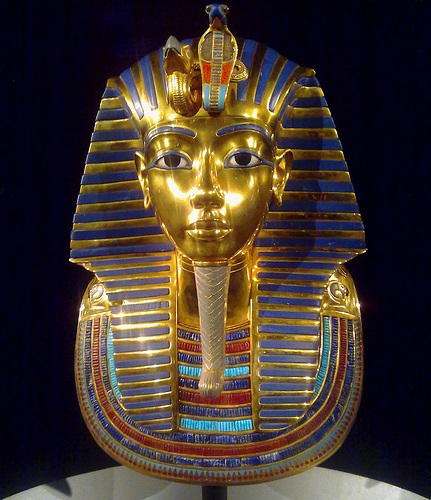 King Tutankhamun: Tragic Victim of Reckless Driving? What do you know about King Tutankhamun? You probably know that he was a boy King who died before the age of 20. You may also know that his tomb was famous for being a very rare example of one in the Luxor region which hadn’t been ransacked and left virtually empty. But did you know that he probably died in a traffic accident? To be fair, no one really knew until recently so you shouldn’t beat yourself up about it too much. The young Egyptian king’s death has been the subject of mystery and speculation since his fabulous tomb was discovered by Howard Carter in 1922. However, investigators from the Cranfield Forensic Institute now believe that he was killed in a gruesome chariot accident. A series of injuries down the side were the clue to this discovery, as they allowed the researchers to carry out a simulation of the incident which caused them. Scientists now believe that the young king was hit by a speeding chariot while he was kneeling down. The force of the impact shattered his ribs and destroyed his heart, which is why the mummified body was found without a heart in it. You see, there were reckless drivers around back in the 14th century BC as well. Now the only question which remains is why he was kneeling in front of a blooming speeding chariot in the first place. Was he placed there by a rival to the crown looking to knock him off, did he fall off his own chariot in front of another one or was a bit of a fool who liked to kneel down in front of the oncoming traffic? I guess we’ll need to wait for the next study to tell us more about King Tut’s traffic accident.